Viking's front coilover kit combines a high quality hybrid spring with a 19-position double adjustable shock. 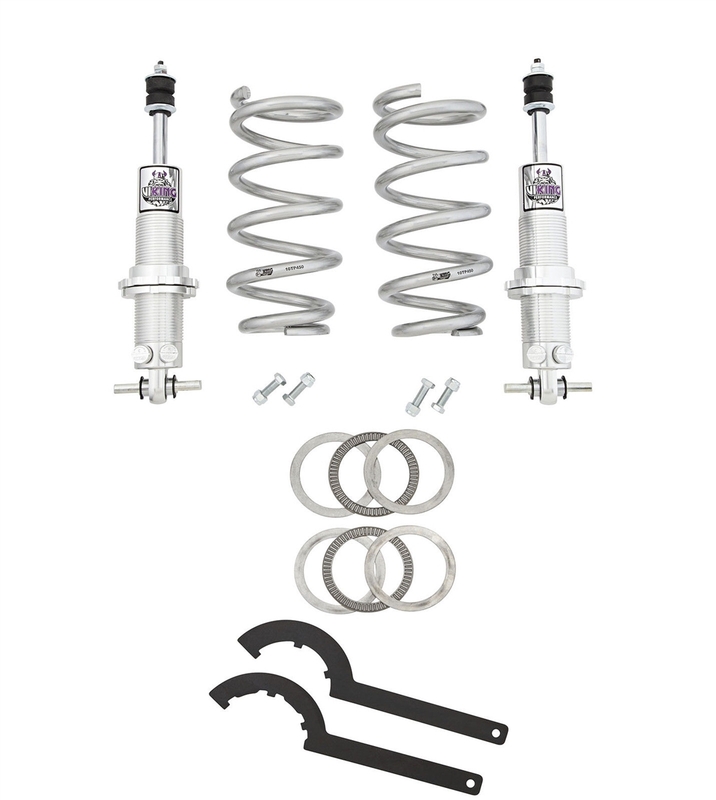 The upper coil fits the upper spring perch on your vehicle while the lower part of the coil matches the coilover shock bottom. A coil spring compressor is not required, as the adjuster acts as the compressor. The optional thrust bearing and spanner wrenches allow for easy adjustment of ride height from factory to 1-1/2" lowering. The shock itself has independent compression and rebound adjusters to allow custom tuning for street, strip, auto-x and road race - all in one shock. Ride height info: The G-body and S-10 platform is very sensitive to ride height vs spring rate. Contact us if you are interested in lowering further than 1-1/2" below stock. We will tend to use the A234 shock and advise on proper spring rates. High rate springs may not allow as much drop as you desire. Bearing Mount: Viking offers two mounting options for the lower shock attachment points. Mild street applications can use polyurethane for ride comfort and reduced harshness. Corner carving, drag racing, auto-x and road race should choose bearing ends for increased reliability and performance. By their very nature, performance parts both in poly and bearing, tend to feel and sound different than rubber mounted factory parts. Bearing mounted bottom for increased reliability and performance. Spanner Wrench & Thrust Bearing Kit: Spanner wrench tool is used to adjust vehicle height while shock stays mounted. This wrench is needed to make height adjustments. The thrust bearing kit is designed to be placed between the spring and the spring seat attached to the shock. This makes for easier adjustments since the spring seat is rotating on a bearing. This kit is recommended for easier adjustments but is not needed to complete the installation. We do not recommend adjusting without a thrust bearing kit. 250lb- 11” tall springs for drag race only. Serious lightening required. 350lb- Small block cruise or drag race with lightening required. 450lb- Small block cruise, big block drag race.